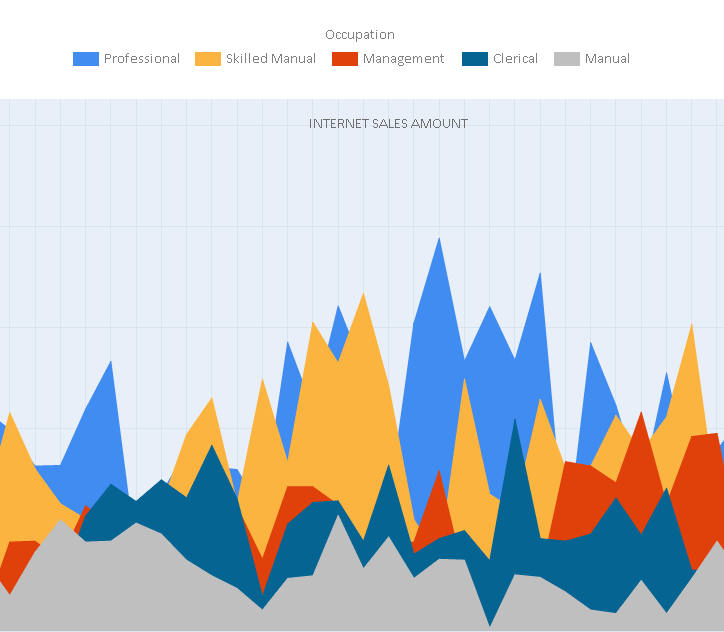 OLAP Reporting with 'Kyubit Business Intelligence' is an easy way to prepare stunning visualizations and OLAP reports in a couple of minutes, including software installation. 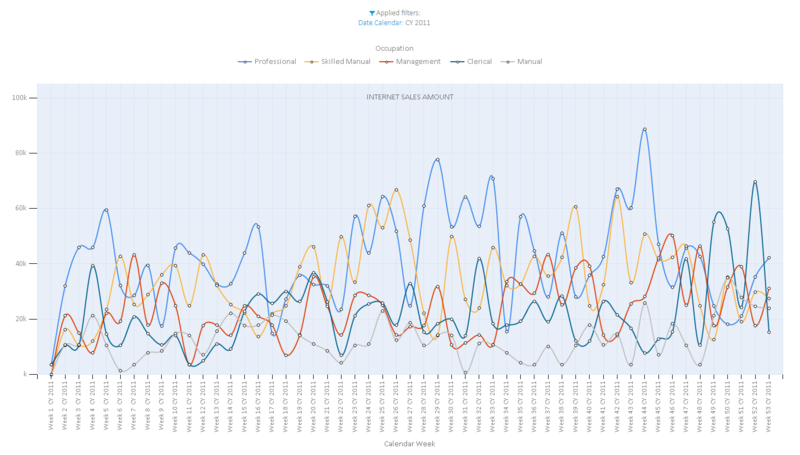 With Kyubit OLAP reporting software subscribe to OLAP report and receive fresh data on scheduled time. Collaborate with other users on the same report or add comments and start discussions. 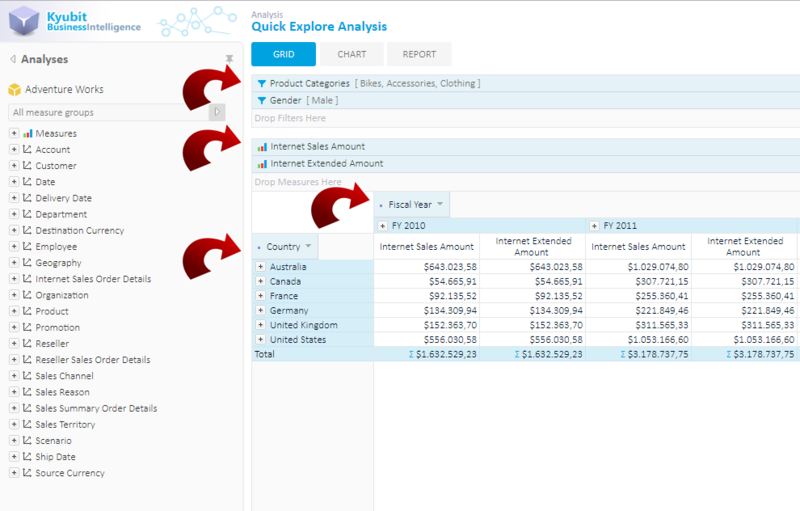 Using OLAP analysis grid and chart view, a user prepares data of current interest that will be base for the OLAP report. OLAP reporting has features to add OLAP dimension hierarchies on both axes and expand certain members to show drill down of data. Multiple OLAP measures could be part of a single report, each measure with a defined aggregate operation to show in totals. 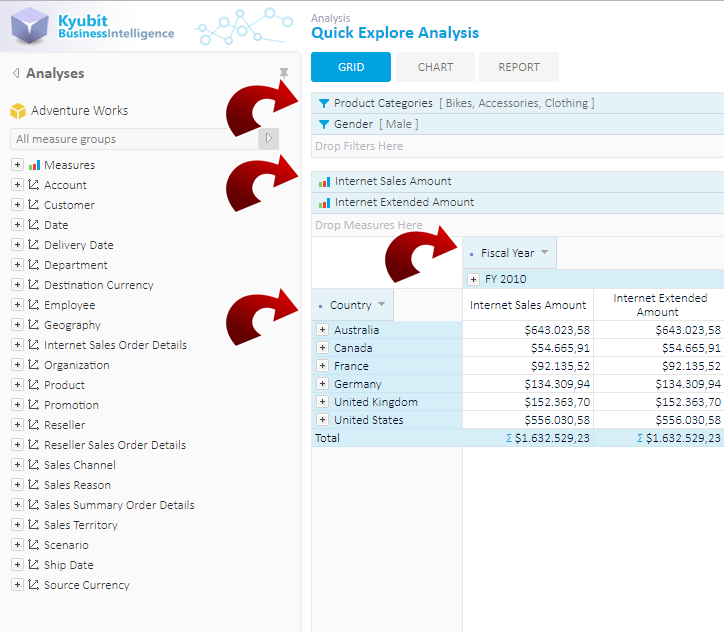 OLAP filters are an important part of OLAP reporting with 'Kyubit Business Intelligence'. 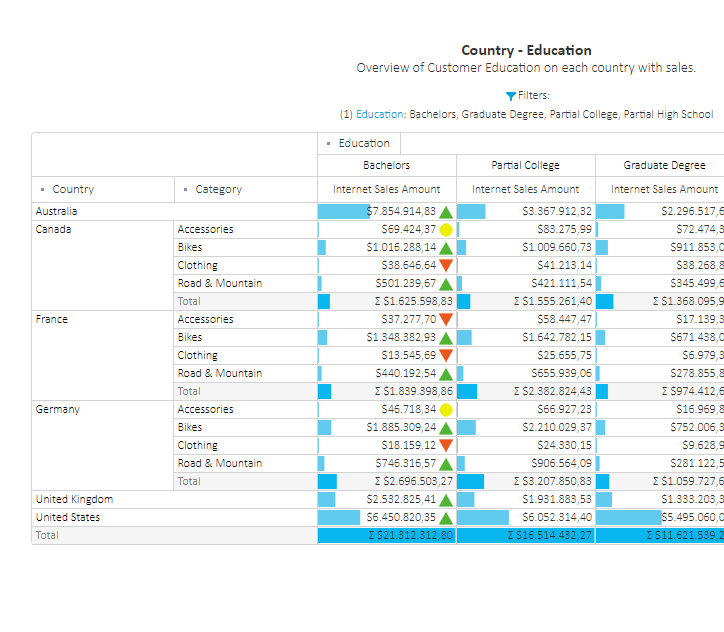 While designing OLAP report, Filters will be set by adding OLAP dimension members that will be slicers for OLAP report. 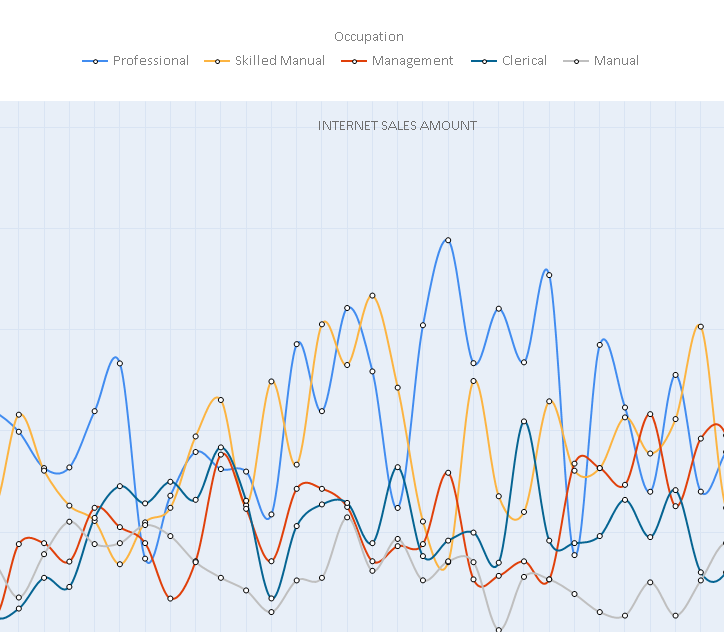 Optionally 'Grid' and 'Chart' data presentation could be included, custom Title and Description that can contain HTML, the position of the visual elements and 'Value bars' that visually indicate an amount of data in each cell, compared to the totals or grand totals. OLAP reporting has features for end users to add their own comments, make discussion and share their thoughts on OLAP related data on the report. 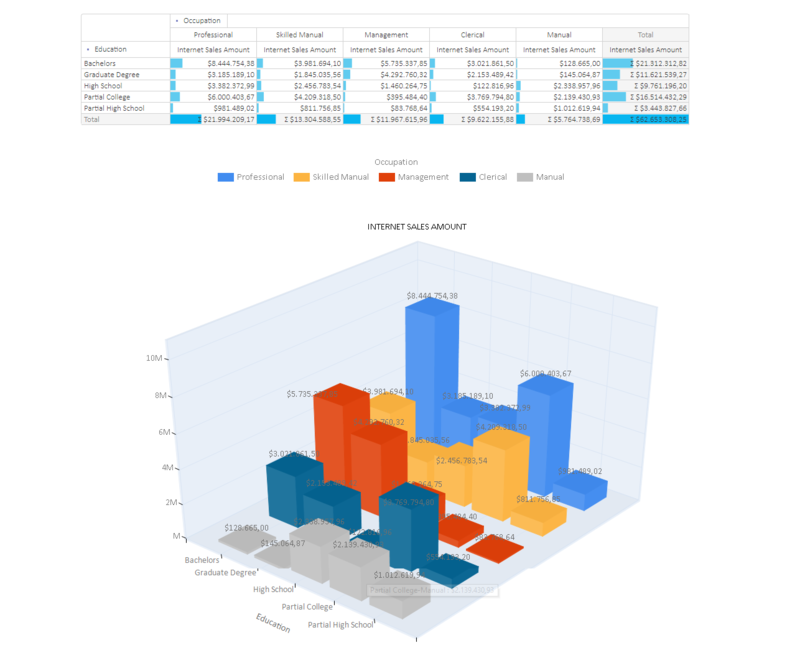 Learn more about OLAP analysis to start the creation of the OLAP report. OLAP reports are organized in folders with unique permissions defined for users and groups and definitions who can only read or change existing OLAP report. Folders present a place to share BI content between users and groups with the same access level to OLAP reports and Dashboards. A user can set a notification on a folder and be notified by the application about new OLAP report in the system or new comments added to OLAP report by other users. 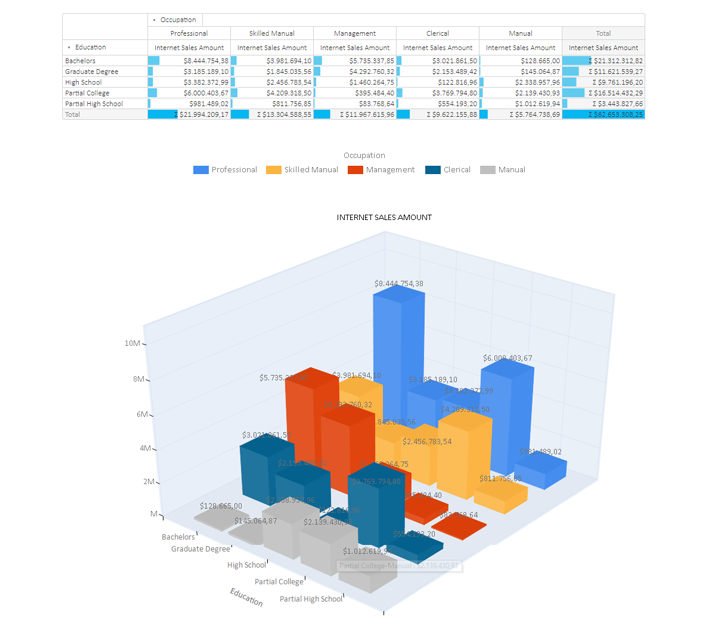 Beside single OLAP report generated by the single OLAP analysis, 'Kyubit Business Intelligence' also includes features to create dashboards that includes many visualizations, metrics and indicators that are based on multiple OLAP analyses, but also MDX and SQL queries. So, if OLAP data of interest is not practical to get by drag-and-drop OLAP analysis features, user can always write MDX queries for full benefits of OLAP environment and MDX syntax queries to get full OLAP reporting experience. 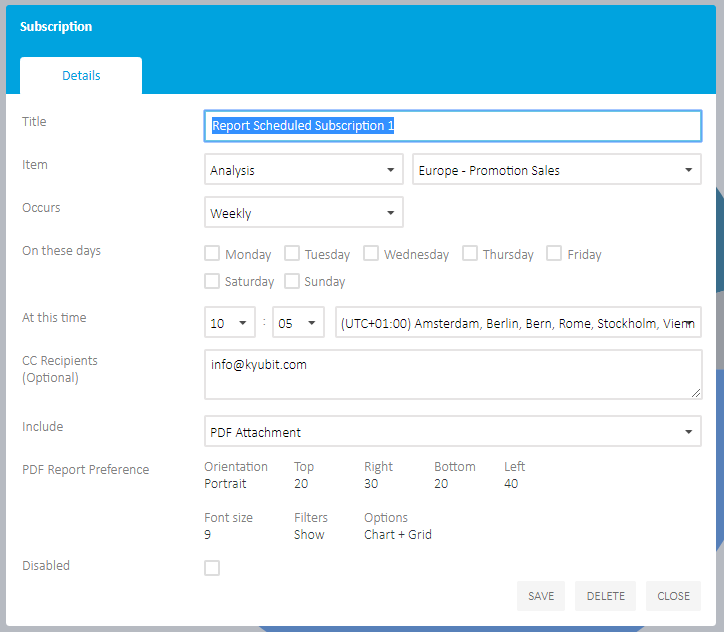 All 'Kyubit Business Intelligence' users have options to subscribe to a certain OLAP report analysis and schedule time to receive the email that contains the current output of given analysis in the grid and/or chart format. 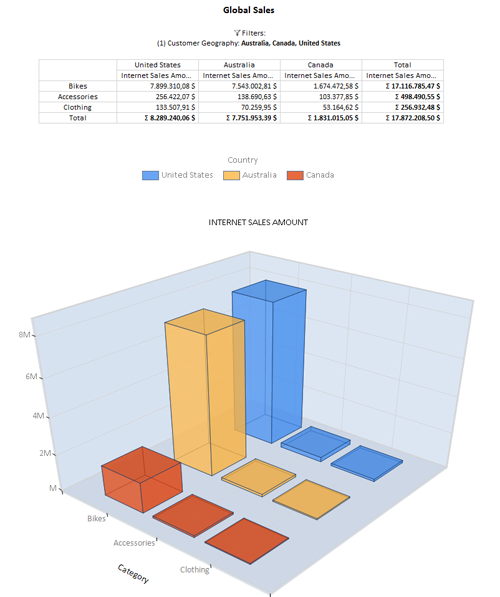 Subscription mail contains embedded chart image, grid and link to open analysis for further OLAP analysis operations and activities. Scheduled OLAP reports provide the ability to receive fresh OLAP data on a regular basis and recipient event does not have to know that there is OLAP client software behind received email. 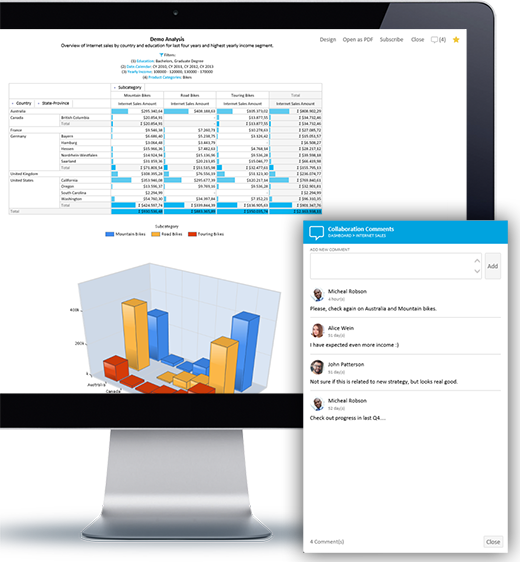 The user immediately sees OLAP report grid and/or chart image (embedded in the email) without having to click any link in received email, making it this OLAP report subscription solution very practical solution for any users not having a habit to proactively use OLAP software. However, any OLAP reporting recipient has the option to click on the link in email details and continue OLAP analysis for further analysis of OLAP data. For more details on OLAP reporting and scheduled subscriptions, see Subscriptions section in OLAP Analysis user manual documentation. 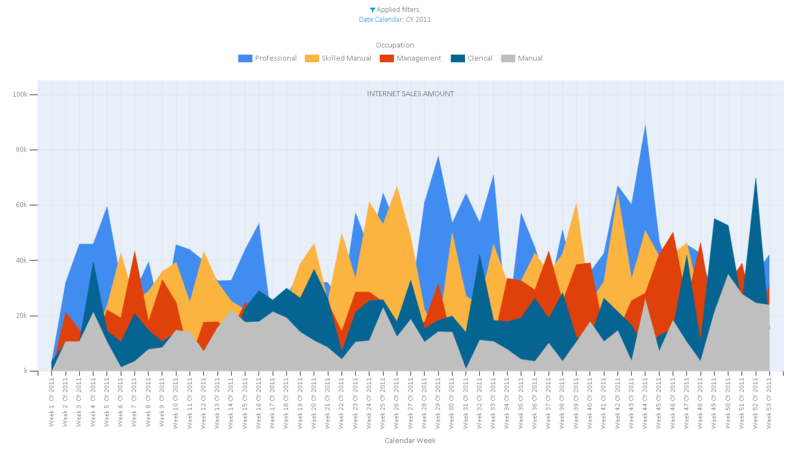 Download 30 days evaluation of 'Kyubit Business Intelligence' and try its OLAP Reporting features in action. 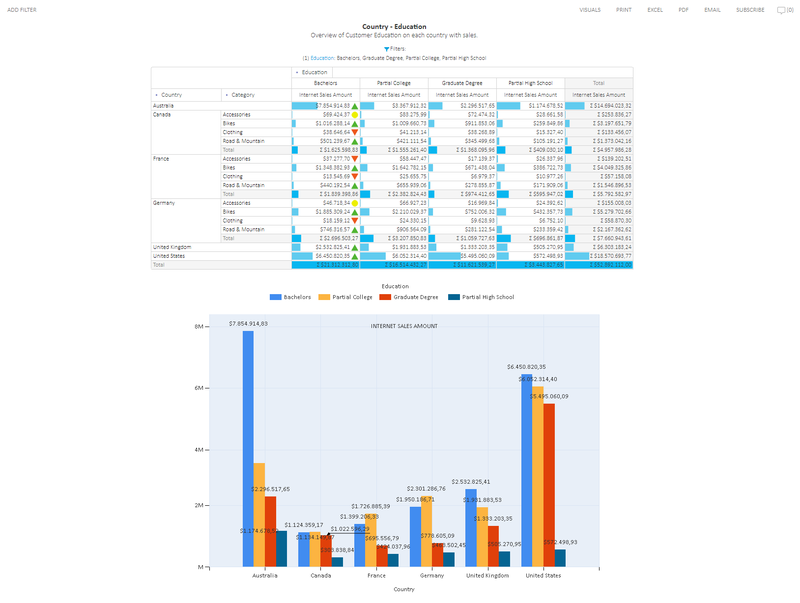 Download 'Kyubit Business Intelligence OLAP analysis - User Manual' which covers all aspects of OLAP reporting features usage.